It's been a busy day but I think I finally accomplished all I set out to (for today that is!) Tomorrow starts the first day of a new way of eating for DH and myself. I'm really quite tired of being the size I am and it's time I do something about it. Luckily DH want's to lose a bit of weight as well so we're in this together. (Lucky for him as I wasn't planning on cooking two meals each sitting. lol) I spent a good bit of time today cleaning out the kitchen pantry and the referigerator, packaging up foods that won't be on our menus anymore so that they can be donated. I think it will make it less stressful to open the cupboard and see foods we can eat now and not run into the "can't haves" all the time. Anyone who knows me personally will know that I completely become obsessed with anything new in my life...be it animal, craft or the new diet and (besides knitting or spinning) can't talk about anything else. I'm hoping that passes soon as I'm starting to irrate even myself. ;) I will not be discussing it everyday on the blog (much like when I quit smoking) but will notate any significant sucesses. I'm pretty excited about it and will calm down and relax once I quit over thinking the darn menus lol. On to happier and more craft related things. This green what I've been using to keep me visually entertained. Notice it's not purple. lol. 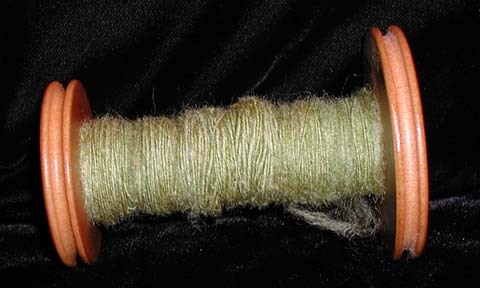 This is the moss green fiber from previous dyeing/carding posts. It's spinning up a wonderful solid green. The plan is to make two singles in this green and ply it with a natural brown wool that I have. 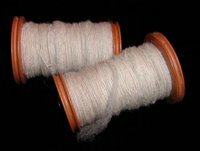 It would be my first three ply and the green is truely calling out for some brown to ground it a bit. 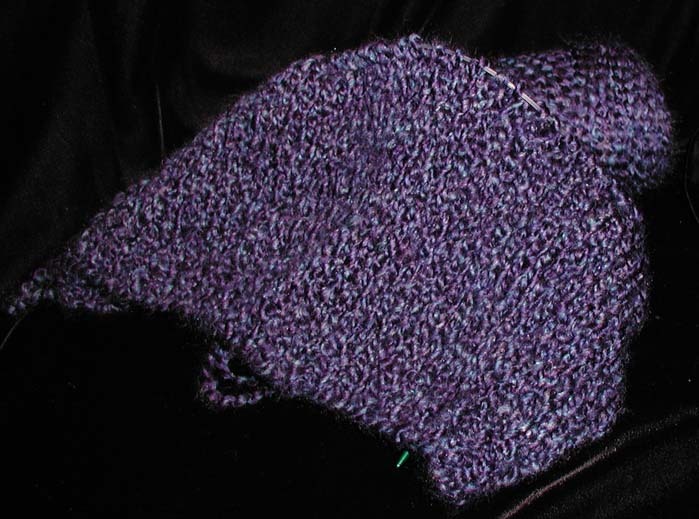 And here is the progress picture of the Hooded Sweater I am currently knitting. I picked up a circular needle today at the craft store and transferred the knitting over to that. It has made a world of difference! Not only am I knitting a bit faster, but the weight of the yarn is not hanging on my wrists so I'm able to knit for longer periods of time. I have only been able to work on this for an hour so far today, but I'll knit some before bed. I don't have any other projects on the needles, hooks or beadbox right now, so any craft time I take during the week is split between the spinning and the sweater. Mostly this week it has been spinning as the knitting was slow and painful. Now that I have it on a circular, I'm hoping to make better progress.